Welcome to page of Oleander Garten! Conveniently located budget accommodation set on western side of Football Stadium, only walking distance to everything including beaches, marina, bus & railway station, city centre, shops, and just one hour drive from Budapest. It is a great place for visitors as a base to explore the finest beaches on the Gold Coast of Lake Balaton as well as to discover the attraction and beauty of friendly Hungarian towns and villages. It is ideal for singles, couples, families or a group of 15, also a perfect stopover for backpackers. It is excellent for romantic weekends or longer holidays. Delicious breakfast served either in the dining room or on the large oleander-fenced terrace with a view of characteristic residents houses and contemporary church tower. 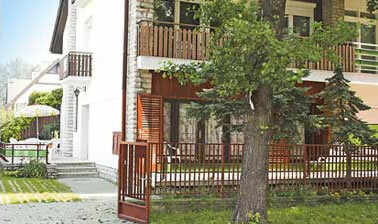 Oleander Holiday House is a self-catering accommodation located in Siófok. The property is 1.6 km from Siófok Train Station and 1.8 km from Galerius Wellness Bath. Free WiFi is available. Accommodation will provide you with a TV, a terrace and a seating area. There is a full equipped kitchen with a microwave and an oven. Featuring a bath, private bathroom also come with a hairdryer and free toiletries. You can enjoy lake view and garden view.